Some cats have specific nutritional needs in order to be happy and healthy felines. You can’t just feed them any cat food you want. We are going to cover some of the top dry and wet cat foods to feed to cats that have allergies or sensitivities to foods. These are generally cat foods that have been specially designed to contain no ingredients that could trigger allergic reactions. Not every cat that is sensitive to food has an allergy, but there are still some benefits to giving your sensitive pet hypoallergenic food. Another sign is that they may not want to eat the food you give them. Of course, if you are not sure if your cat has allergies, then you should take it to a vet to be examined before you make major changes to their diet. If your vet does recommend a new diet, though, then hypoallergenic cat food would be the way to go. It’s the safest kind of food to feed to sensitive cats. It prevents allergic reactions– Honestly, this is the best reason to buy your cat this specialized food. Most people would not even consider buying specialized food for their cat unless they start to see an adverse reaction to it. It is the safest kind of food– You don’t have to wait until your cat is exhibiting allergic reactions to buy it hypoallergenic food. You can simply do it as a safety precaution, just in case your cat may be allergic or sensitive to certain types of food. Your pet will be happier– Even cats with mild reactions to certain types of food will be much better off when you make the switch to something that is gentler on their body. You may not always see the allergic reactions your cat is having, and you may not know the extent of their suffering, but once you give them food that is better for them, your cat will have more energy, will be more likely to eat its food and will experience a better quality of life. Your cat will live longer– Allergic reactions in pets can seriously damage your feline’s health. Sometimes, such reactions can even cut your cat’s lifespan short by months or years, and you want to be able to enjoy as much time with your cat as possible. Switching to hypoallergenic food can make a difference in how long your cat lives. Now, let’s review a few cat food products that can benefit your sensitive cat, starting with the dry food options. As the name suggests, this cat food only has a few ingredients that limit its potential to cause an allergenic reaction. It is made without grains and contains quality duck meat, which is excellent for creating a shiny coat for your cat. It has been crafted without the use of artificial colorings or flavorings to give your cat as natural a meal as possible. The product is tested regularly to ensure that it meets safety standards and also to provide transparency for the people purchasing the product. In fact, the manufacturers actually share those testing results with the public on their website. So, if you have any concerns about the safety of the food or how agreeable it will be to your cat, then you can simply check out those results. A number of customers reported that this food was not agreeable to their cats. It’s not that it caused an allergic reaction, but the cats refused to touch it, as though it tasted unpleasant. Those with picky eaters may want to try a trial size of this product before investing in a larger bag. Uses a very simple formula. Rigorously tested to ensure safety and agreeability with sensitive cats. May not be palatable to all cats. Here is a dry cat food that has been created to give your cat’s stomach a lot less work to do. The ingredients have been chosen for the way they digest easily and can be used by the cat’s body quickly without having to spend a lot of time in the digestive system. It also contains nourishing supplements that fortify feline skin and contribute to a healthy, shiny coat. This product is packed with nutritional value. Besides what we just covered, it also includes antioxidants to help fight off disease and strengthen immunity. No allergenic ingredients greatly decreases the chances that your cat will have an allergic reaction while eating it. Hills has worked very hard to make this one of the premier choices for hypoallergic cat food on the market, and a high-end product comes with a high-end price tag. This is one of the more expensive hypoallergenic options, but for many cat owners, it is worth it. Packed with nutrients of all kinds. Very low allergen risk, thanks to the use of carefully chosen ingredients. Designed for a healthy, balanced diet. Now, here are our top choices for hypoallergenic wet cat food. 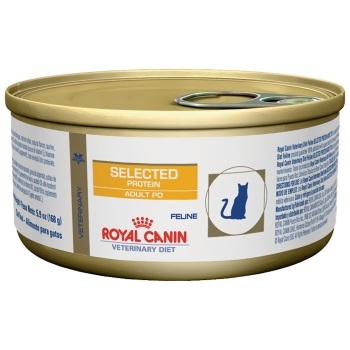 This hypoallergenic selection from Royal Canin comes with chelated minerals that are very simple for your cat’s body to digest. This means that the minerals have been bonded to form a single material that isn’t as complex as its original parts, and cats’ stomachs have an easier time passing that through their system and metabolizing it. The Feline Selected Protein product also contains lots of antioxidants to keep your sensitive cat’s immune system function at its peak. Plus, there are Omega-3 fatty acids that are excellent at creating a thick, glossy coat of fur- perfect for helping your cat recover from its allergy symptoms. It’s made from peas and duck, which are both easily digestible and very healthy for your cat. These are known to be some of the most palatable ingredients for cats, and many cats who vomit regularly after eating should have no trouble keeping this cat food down. As with many hypoallergic foods, the lack of certain artificial flavorings can make the food smell unpleasant for people, but most cats won’t mind and will heartily consume it. Your cat should have an easy time digesting this food. More than just easily digestible, it is also incredibly nutritious. Easy for sensitive cats to keep down. This requires a veterinary prescription to order. The smell may be unpleasant. 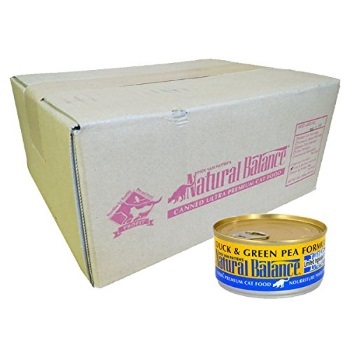 Nature Variety used farm-raised animals and pork liver for most of this cat food product. Only about 5% of it contains anything else, and that includes fruits, vegetables and minerals. There are no grains, potatoes, soy or artificial flavorings and additives in this product, which are known allergens. The absence of these ingredients means that it is highly unlikely to cause an allergic reaction in your cat. 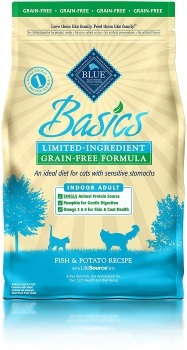 This product is designed for cats that have had an adverse reaction to other types of food and may have been vomiting. 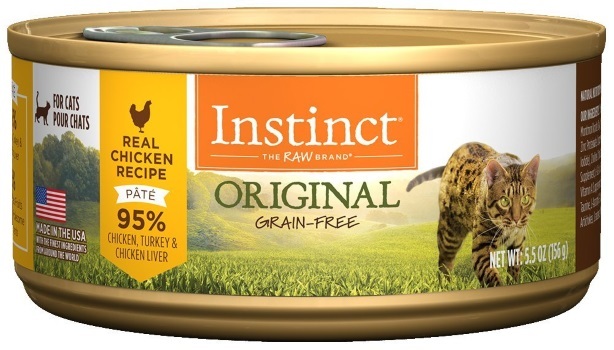 Many customers report that after using Nature Variety’s Instinct line of cat foods, their feline exhibited much better behavior and kept their food down. This is also a great substitute for fish and fish oil cat food products. Most hypoallergic cat foods contain at least some fish oil, which a small portion of cats can be allergic to, and if that is the case, then this may be one of the better options for those cat owners who feel like they have very few choices. Contains no fish or fish products. Made from natural, high quality ingredients. Easily digestible for cats of all ages and sizes. Can cause cat feces to have a pungent odor. 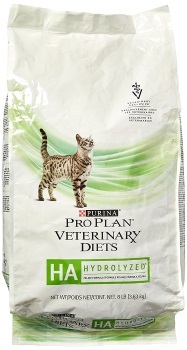 Purina’s version of hypoallergenic cat food uses a carbohydrate source that is very unlikely to cause an allergic reaction in most cats. Of course, the pickier eaters may still have some problems with it, but it should not cause them to become ill or exhibit signs of an allergic reaction. It is designed to be highly digestible and easy on cats’ stomachs. This product is made from rice starch, chicken liver and a few different kinds of oils, among other ingredients. There have been reports of some cats experiencing loose stool or even explosive diarrhea after eating this cat food, but they were a minority. Most cats find it just fine, without having any digestive issues, and it manages to clear up their vomiting and skin allergies quickly. Purina’s hypoallergenic cat food is more than just a low-allergen food. It is also packed with vitamins and nutrients that enable your cat to have a healthy diet. This is a great food for cats of any age. Made from a low-allergen source. Contains numerous nutrients to encourage a healthy diet. May cause diarrhea or liquefy stool in some cats. The price is a little high. 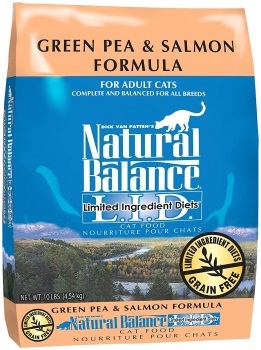 When Nature Balance was putting together this hypoallergenic cat food, they were careful to make it without any grains or other potential allergen triggers. That means no soy, no artificial ingredients and no manmade additives. They opted for fresh, high quality ingredients which are designed to be very nutritious and easily digestible cat food combinations. The low number of ingredients used in each type of Nature Balance Limited Ingredient products greatly decreases the chance of an allergic reaction, according to PetCareRX.com. At the same time, there are enough carbohydrates and protein in this food to ensure it gives cats a healthy and balanced diet. That’s incredibly important for cats that have had some trouble processing and keeping down other types of food. This product is easier on their stomach and easily digestible to cut down on digestive problems. Most cats love this food, but a few of the pickier eaters may stay away from it. 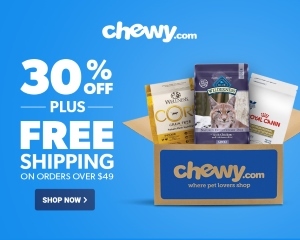 Thankfully, there are a few different flavors available, so that most pet owners should be able to find a flavor their cat likes. Includes lots of nutritious ingredients. Is extensively tested to ensure quality and safety. Those were our top picks for hypoallergenic cat foods, and we hope one of them will make your cat a happier, healthier animal. You may need to try a couple of these out before you settle with one your cat likes. Just because your cat isn’t experiencing allergic reactions anymore, that does not mean that they will like the food. Once again, if you are not sure that your cat is having allergic reaction to what you are feeding him or her right now, then it is always safer to check with a veterinarian rather than to just decide on dieting changes on your own. You want to be sure that your cat is getting the help it needs and that the food it eats is the best that can be. Once your cat is eating food that doesn’t cause an allergic reaction, though, you should see a big difference in its disposition, energy levels and health. You will likely also find that your cat is more excited about mealtime and is more likely to eat all its food. Hypoallergenic food can make a huge difference in your cat’s life, but you need to choose a high-quality product that uses only the best ingredients and that has been proven to help sensitive cats.